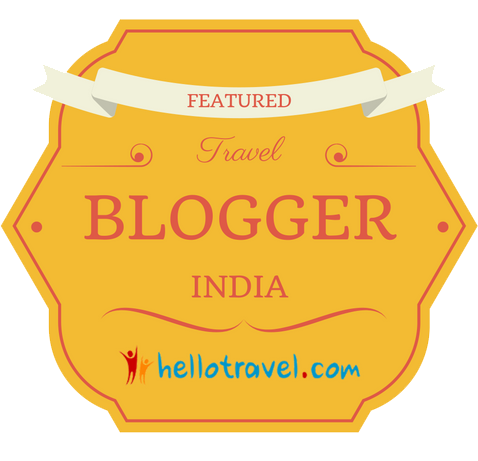 Situated in the South of Delhi is the rather trendy and sort after area that is Hauz Khas, known for it hip and quirky, artistic boutique shops of clothes, furniture and very popular restaurants and cafes. At evenings and weekends it will be packed with the 'young and beautiful' and many expats. Indeed we may not come under the title of young or beautiful but, yes we are expats and yes, we can be found there hunting through the shops, visiting our 2 favourites - the brothers who rescue and repair old silk saris and the small silver shop where, the owner is so passionate about his old items that he will happily talk to you for hours showing you his wares. Needless to say we have items from both shops and I'm sure we'll have more!! We also try to avoid the furniture stores but again have failed there too, but we are being strong and resisting the urge to 'just take a quick look'.... for the moment at least. So after a couple visits here and spotting numerous tombs I took myself to investigate the area. Starting from the Outer Ring Road I wandered through the Rose Garden, still desperately looking for snakes but still they allude me here :( What I did spot was dozens of peacocks, noisily mewing to each other and scurrying around both on the ground and in the trees. Now since a child I have always been fascinated by these electric blue/green birds and used to make my father drive a certain way home, after visiting my grandparents, as there was a large house which had them in its grounds. Here I've been happily surprised at the number you will see. I am looking forward to procuring many feathers (you see bunches of them for sale on the street corners) Why this is called the Rose Garden I do not know as there doesn't appear to be rose in sight! All the same it makes a nice short stroll through the woods to HK Village and the Deer Park. Passing below the modern village and its restaurants you come to the rather striking Hauz Khas complex, sitting at one corner of the lake. Here you will find a madrasa (Islamic school) a mosque, tomb and pavilions. This L shaped complex has the lake at one side and a garden to the other, home to 6 domed pavilions. Access to the complex and the gardens is now from the village, you can no longer climb the many stone staircases from the lakeside. In the centre of the L shape is the tomb of Firoz Shah Tughlaq who reigned after Khilji from 1351-88 and who built the city of Firozabad. Firoz Shah de-silted the lake and added many more buildings to the area. He built the mosque to one end of the complex and at the other the madrasa, which became a world renown school of Islamic teaching in that time. This complex in itself deserve further investigation and a post all to itself. A rather plain square building, built of rubble, is all that remains of the pavilion which has 4 entrances and 4 staircases up to what would have been the 2nd storey with a domed roof. 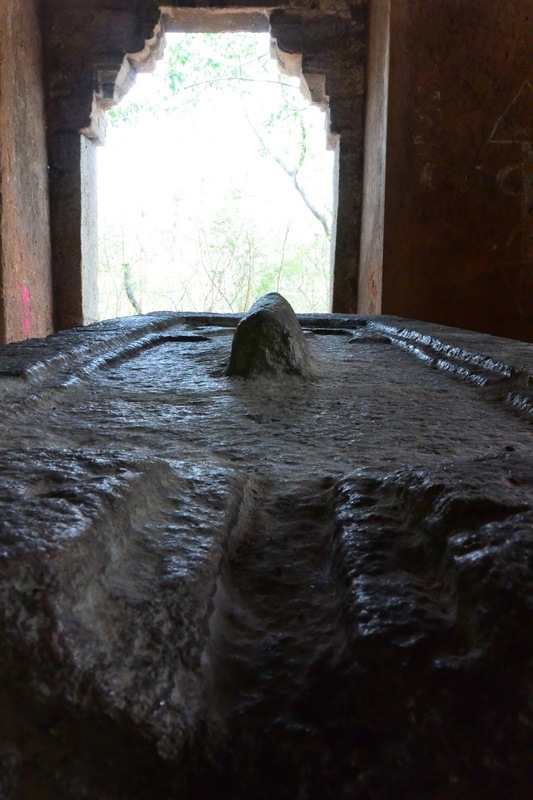 There is some suggestion that it is in fact built as a tomb but never completed. Its also believed that it was once situated on an island (sits now on a hillock) inside the tank which in the past was much larger than what you see today. By the way you will see many monuments named Gumbad, the word translates as dome or Pavilion. 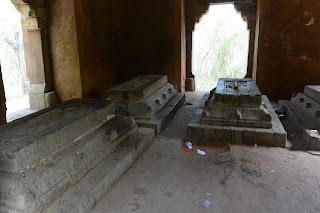 From Munda Gumbad I finished the loop around the lake and skirted the deer enclosure, to head a short distance into the Deer Park where 2 more tombs can be found sitting across from each other, Kali Gumti was the first small one I took a look at. The name itself translates to black domed building/tomb. There is however no evidence that a grave was ever inside it. It was believed to have been built in the Lodi era of the 14th Century. 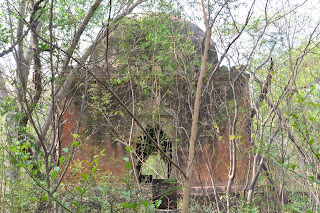 It is a small domed building yes dark in colour, now covered in scratched graffiti, sitting upon a small plinth in dappled light, surrounded by trees. To one side you will see a wall known as a qibla, within this is a niche or arched alcove that points the way to Mecca, the direction for prayers. 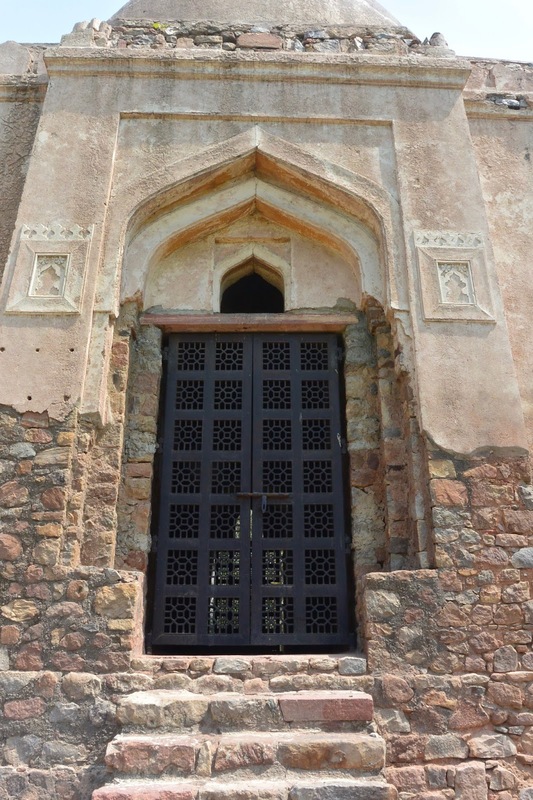 This niche is known as a mihrab, certainly more attractive than the arrows you see in hotel rooms pointing to Mecca. 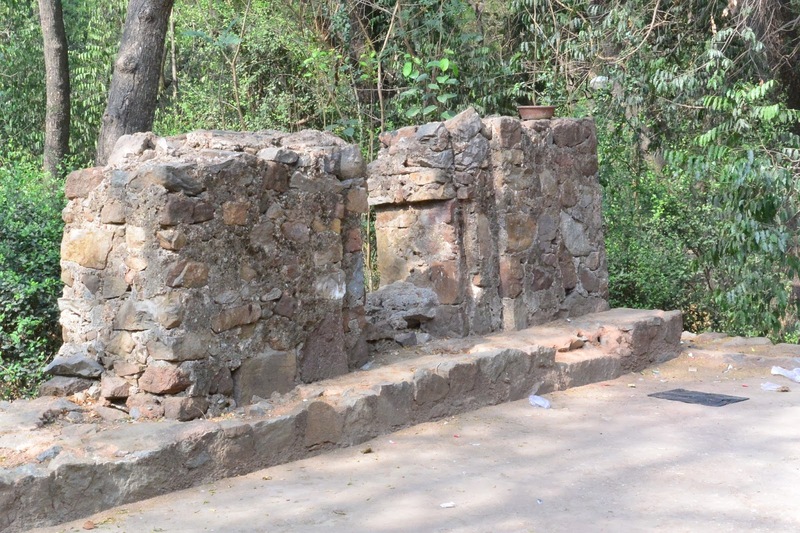 Whilst researching I read that in recent times Kali Gumti was used to house animal feed, happily no more, even if its covered in modern day graffiti. Just a few feet away from little Kali Gumti is the much larger and grander structure, what appears to be its big brother, Bagh-i-alam ka gumbad. Believed to have been built around 1501 this is quite a majestic building and is in fact the largest in the Deer park. It is a stunning building architecturally that is now thankfully a protected monument. It is made of local dressed stone and red sandstone with beautiful vibrant blue ceramic tiles that can be seen around the window above the main entrance. Inside are 3 tombs but its unknown who they belong too and on the West wall of the gumbad is an mihrab. 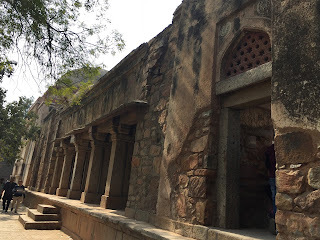 Adjacent to the tomb, like that of Kali Gumti, sits a mosque, although much larger and grander, which would have been in a Tughlaq Arabic garden. This large qibla has 5 alcoves/niches, mihrabs and sits on a large square plot with tombs inside, now used to feed the local birds. NOOOOO! researching the history of these tombs and structures I've realised I've missed another one, tucked further into the deer park. There seems some confusion on its name and indeed it can't even be spotted on Google maps. 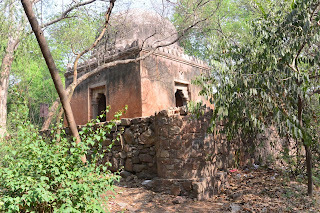 Believed to be called Tohfewala Gumbad (although another argument for that named gumbad can be found a short distance away in Shahpur Jat village) I will need to return and search this elusive gumbad out very very soon. See Bottom of Page, the intrepid explorer (lol) went back and 'discovered' the Lost Tomb of Hauz Khaz!!!!! Exiting the Deer Park and leaving Hauz Khas behind me I walked down the road passing the startling brilliant white Hindu temple (and tourist attraction) of Jagannath temple. I didn't venture inside today as I wasn't travelling through the 1960s today but was much further back, walking through from 1296 up to the 1500s. Built by the Oriya community and dedicated to the Hindu God Jagannath it is an extremely popular and bustling temple, but a visit for another day. Another small domed tomb is the next you come to on your left handside. 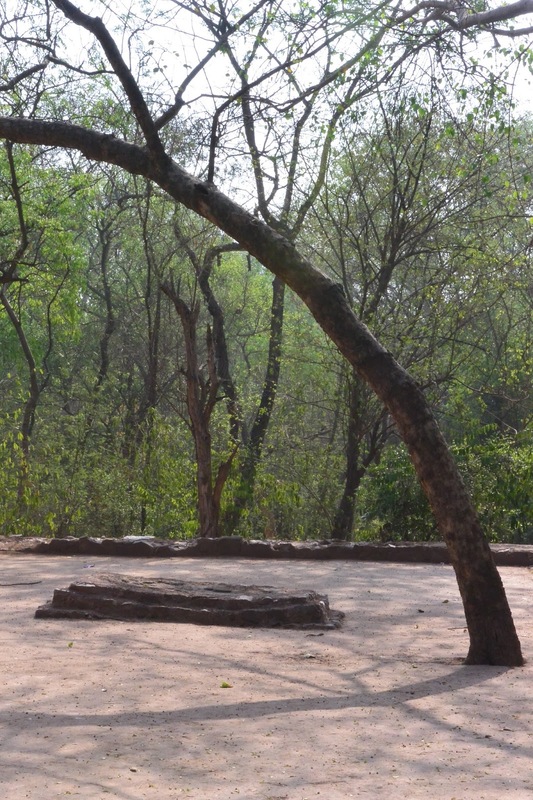 Chhoti Gumti is surrounded by grass and a metal fence area with a caretaker watering the grounds. 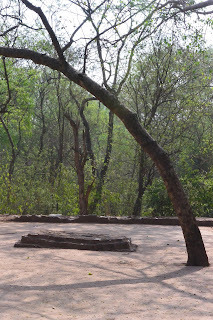 It sits on the corner of a junction opposite another tomb, on the adjacent side of the road that is Sakri Gumti. The name Chotti Gumti means Small dome, pretty self explanatory. There is remains of a grave inside but who it belongs to has long been lost to the past. 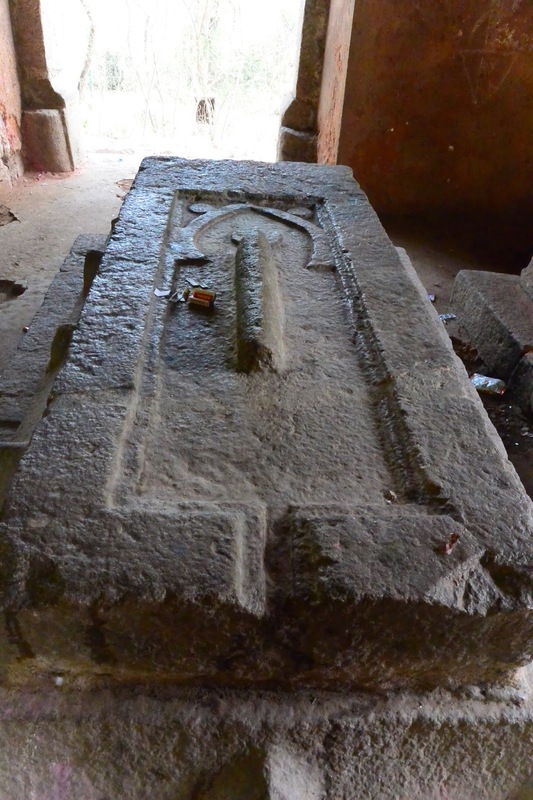 This small tomb has 3 entrances North, East and South, where there would have been fourth in the West is a Mihrab. Due to its design its attributed to the Lodi era and round the 14th-15th century. Ignoring Sakri Gumti I take a slight detour, down the road, as I spied another tomb on the map the other day and take a short 5 minute walk down this bustling street of residential homes and street sellers until I reach a small park, Bal Vatika and walk through until I come to Biran ka Gumbad. 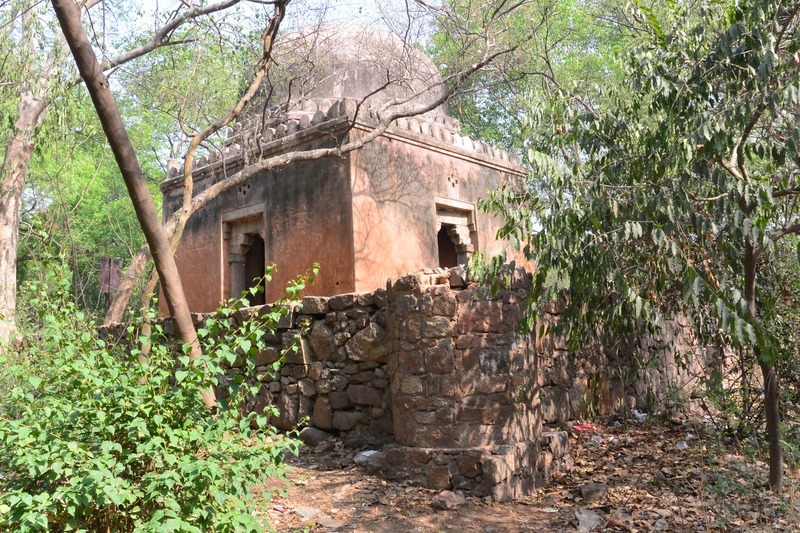 This is quite a large alcove, decorated tomb built in a similar style to the Dadi-Poti tombs which I visit last on the walk. 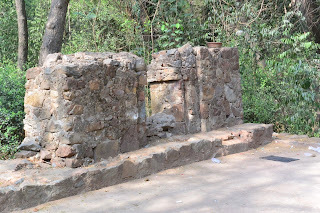 It is a Lodi era tomb, again built of rubble masonry, with the remains of a grave inside although the history of who this was has long since been lost. 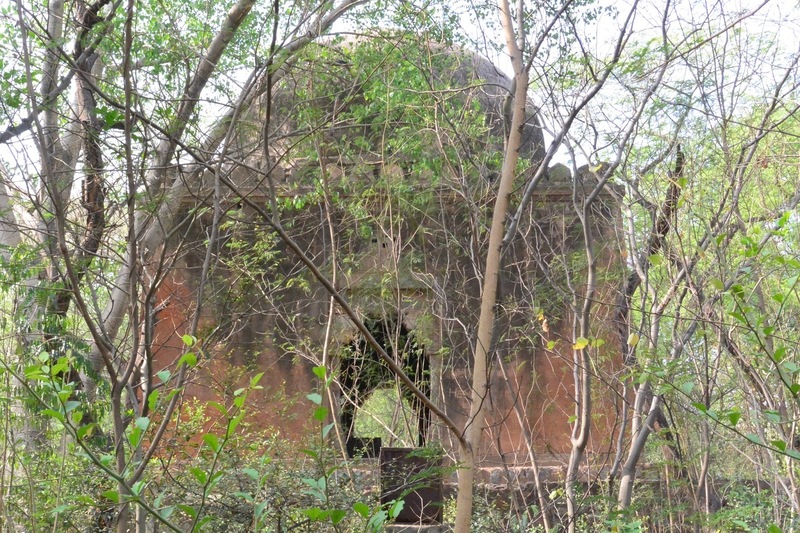 Biran ka Gumbad translates to 'doomed building of the brother' a strange name but again believed to have been a nod towards Dadi-poti. It never ceases to amaze me that here we have these ancient ornate buildings, whispers to a long ago past, and right next door will sit an apartment building, shop or garage. Thank goodness they are now protected as the land on them must be prime retail. It does make you wonder how many have been lost over the centuries. I've read of many that have 'made way for the modern' in the last 50 years alone. Retracing my steps I head back up to the road and on the adjacent side to Chhoti Gumti sits a similar tomb, that of Sakri Gumti. This building is narrow and tall and the name Sakri Gumti translates to "narrow domed building' As there are remains of a wall on the eastern side of the building there are thoughts that this 14-15 century building may not in fact be a tomb, but possibly a gateway.... we will probably never know. It has four entrances and no sign of a grave inside. Compared to the other larger grander buildings, this is small in comparison, at just 4.56 sq metres and built like the others of rubble masonry. I am nearing the end of the walk now as I head down the road towards Aurobindo Market, home to the best and freshest paneer and the much visited Midland book shop. If you've not visited either....do so! As I walk down the road, on the right handside, raised up slightly, is Barah Khamaba. This is a much grander tomb built in the 14th century. Its name means 'twelve pillars" and indeed it does have 12 pillars! and 3 archways on each side. It is not known who it was built for but clearly someone of high status. There is a veranda running around the centre and at each of its 4 corners you will find an apartment. Until it was restored in 2009 (just in time for the Commonwealth Games, when many buildings were restored and beautified) there were people living inside. Outside in the corner of the plot, the remains of another building. 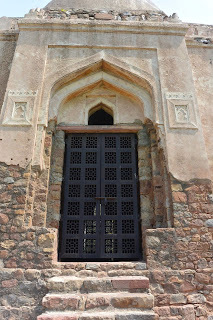 Apparently this was Lalmahal (Kusak Lal) a red sandstone building built between 1266-86 by the then slave ruler Balban. And finally........ (although I need to go back for that missing tomb inside the deer park) I cross the road to the final stop for today. The two buildings that are Dadi-Poti. More precisely they are Dadi ka Maqbara and Poti ka Maqbara meaning Grandmother and Granddaughter. There is no knowledge to who the tombs belonged to, whether they were indeed related or, much more likely, that they were named so as they sat next to each other, one larger and grander than the other and being of different eras. However the one known as Dadi (Grandmother) is in fact younger than Poti (granddaughter) disputing the fact they are indeed related in that way. They sit proudly upon a small hillock, set back slightly to the road I walked along. Dadi ka Maqbara (Grandmother) is the larger of the two and dates from the Lodi period of 1451-1526. It is 15.86 sq metres and houses 6 graves and is more ornate than its neighbour. 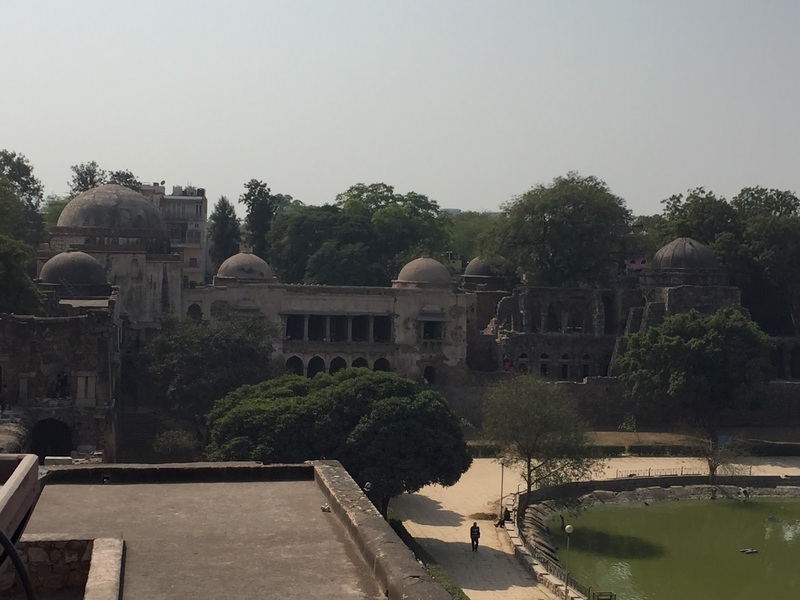 Poti ka Maqbara sits 20 feet away from its larger grander neighbour. 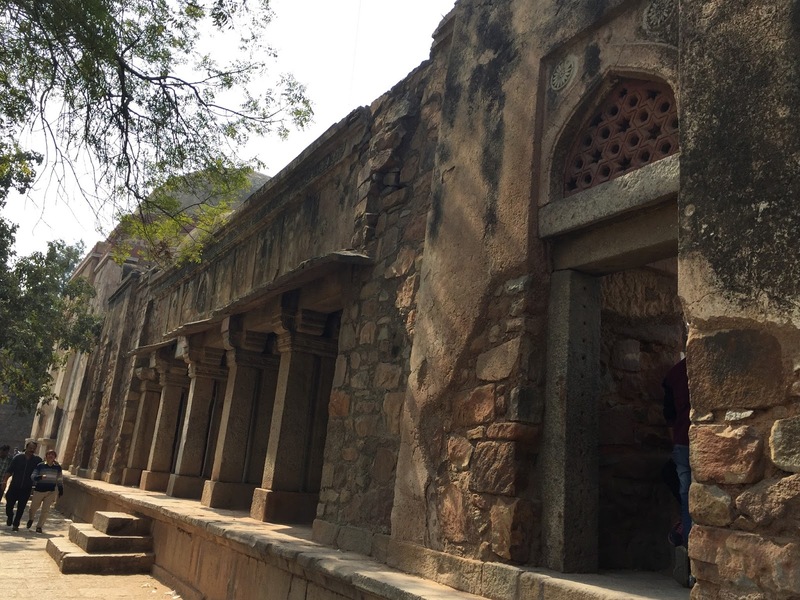 This 'granddaughter' dates from the older Tughlaq Period of 1321-1414. Smaller and plainer it has sloping walls which were typical of this era. It is only 11.8 sq metres with plain walls and an unusual lantern adornment on top of its dome. 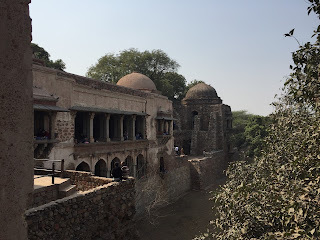 So now I've completed this meander through one small part of the Delhi's past. In just a few small square miles I've found numerous tombs and relics transporting me back almost 800 years. I just need to go back...hopefully next week and spy that elusive missing building! Returned and just a few metres from Bagh-i-alam gumbad and Kali gumti along a path to the right and you will easily spot the elusive gumbo I missed on my first visit. No signs give a clue to its name and very little seems to be on the internet. 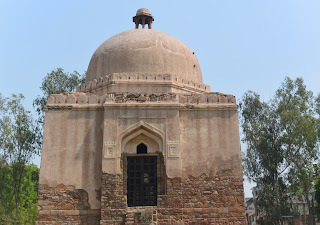 However, the Archaeological Society of India and the invaluable book "Delhi, A Thousand Years of Building" by Lucy Peck, gave this gumbad listed as Tohfewala Gumbad from the early period of the Tughlak era. Stating simply that is was 'plain and unadorned'. No mention of the graves that are inside which are dramatically designed and quite elaborate, what a shame. Sadly much graffiti and rubbish decorate this ancient old building. Absolutely luv your posts Bridget .. full of history and pics ....... extremely interesting ... look forward to the next one !!! Lovely post Bridget! Beautiful pictures and so much information... You must have spent quite some time on the computer doing all that research! Shankar Market Street Art Project.